Five loaves and two fish. Enough to feed a little boy. That was all Jesus had to work with. But that was all He needed. All He needed to feed more than five thousand men. Amazing! Jesus gave thanks. I love this. They were few, they were small, and they were weak, yet He accepted them! And then, He gave thanks for them! Why? He knew what they would become in His hands, what He would make of them. Child of God, do you realize what this means? 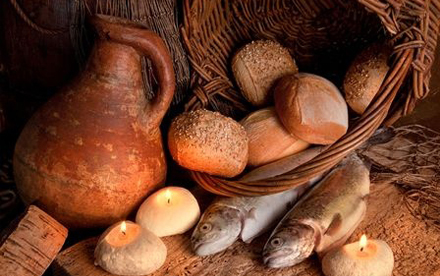 If He gave thanks for five loaves and two fish, just imagine how much He gives thanks for you! If He could feed more than five thousand men with just five loaves and two fish, just imagine what He knows He can do with your life! Others may look at you and think you are no better than a little boy’s lunch. Nothing good or great will come out of you. Too small, too weak, too little. Nothing to get excited about, to give thanks for. But Jesus thinks differently. He gives thanks for you. Why? You are in His hands. And He knows what He is making of you. He knows what you are becoming. He knows the blessing you are destined to be to many. Truly, this is the day the Lord has made. Let’s rejoice and be glad in it! I thank God for you always, thank you Bishop. Ohhh thank you Jesus this awesome!!!! Thank you Bishop, you spoke to my heart. AMEN, AMEN, and AMEN. So be it.So be it.I am thankful that He gave thanks for me. And I am in His hands. I Thank Him that I am destined to become blessing to many. Halaluyah.I am thankful.Yes I am thankful for myself,I am thankful for blessing He is making to become. Yes Lord have your way in me.I give you the Consent. Thank you BISHOP.